If emergency towing is necessary, we recommend having it done by an authorized HYUNDAI dealer or a commercial tow-truck service. Proper lifting and towing procedures are necessary to prevent damage to the vehicle. The use of wheel dollies or flatbed is recommended. It is acceptable to tow the vehicle with the rear wheels on the ground (without dollies) and the front wheels off the ground. 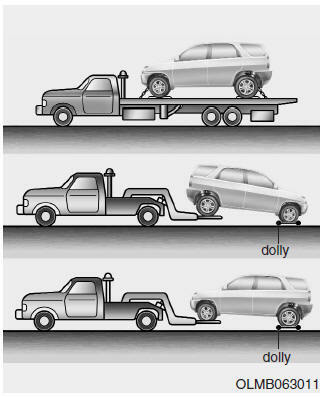 If any of the loaded wheels or suspension components are damaged or the vehicle is being towed with the front wheels on the ground, use a towing dolly under the front wheels. For AWD vehicles, it must be towed with a wheel lift and dollies or flatbed equipment with all the wheels off the ground. A AWD vehicle should never be towed with the wheels on the ground. This can cause serious damage to the transaxle or the AWD system. 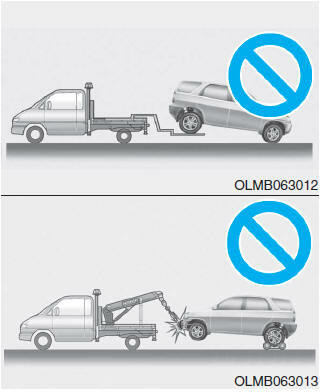 Do not tow the vehicle with the front wheels on the ground as this may cause damage to the vehicle. Do not tow with sling-type equipment. Use a wheel lift or flatbed equipment. If your vehicle is equipped with a rollover sensor, place the ignition switch in the LOCK/OFF or ACC position when the vehicle is being towed. The side impact and curtain air bag may deploy if the sensor detects the situation as a rollover. 1.Place the ignition switch in the ACC position. 2.Place the shift lever in N (Neutral). Failure to place the shift lever in N (Neutral) when being towed with the front wheels on the ground can cause internal damage to the transaxle.